I finally decided to get myself an iPhone. My first priority was make a cozy for it, as I have a tendency to knock things about. 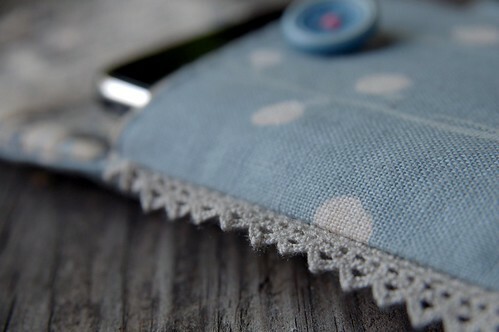 I had a mental list of features it needed to have – interior credit card/money pocket, closure, wrist handle and clip. 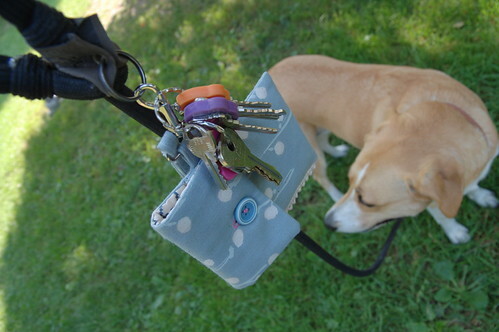 This summer I often found myself heading out the door to walk Maisy with my cell phone and keys in hand, since most of my dresses don’t have pockets. (note to self : start putting pockets in your dresses!) We also walk to and from work everyday and often times I couldn’t hear/find my phone in the depths of my birdie sling. 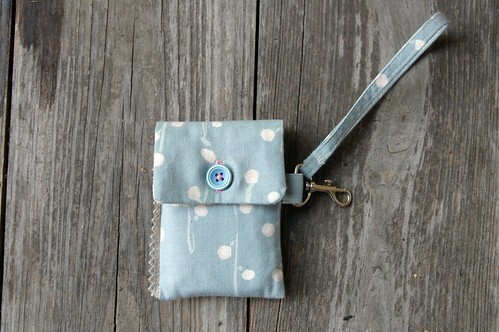 I had been inspired by this pet pouch to make something that might attach to the handle of Maisy’s leash. My original plan was to do a zipper closure. However, when I was designing this pattern, I quickly realized that having a zipper would mean that the cozy would have to be much bigger than I wanted it to be. A magnetic snap was out of the question, so a button was the logical solution. The clip came off an old bag I had a long time ago. I try to scavenge hardware off anything I might be getting rid of. I used a scrap piece of cotton batting off one of my quilts to add a layer of protection in the middle of the fabrics. That sweet piece of lacy crochet trim is from Melinda. She used it on her zippered pouch and gave me the rest. I have decided I need to have more trim in my life. The cozy is perfect. When I head out the door, I just clip it to Maisy’s leash. I even clip my keys into it. No more fumbling around in my bag! my favourite app is Things. I’m constantly writing lists in my head, on scraps of paper and generally, worrying about getting things done. Now, every time I think of something I need to do, buy or remember, it just goes into my Things list where all the items are sorted by priority, tags and projects. I have it on my iMac also and they wirelessly sync to each other. I feel more organized everyday. i just downloaded the Style.com app yesterday and I love it. It’s fashion week in New York right now and I can watch all the shows easily on my phone. i love anything Polaroid, so I had to get Polarize to change my photos to look like Polaroids that you can even write notes on. i really wanted to have bird songs for my ringtone, so i recorded all kinds of wonderful birds from enature.com and created my own… i love hearing the Purple Finch, Northern Mockingbird and Sage Thrasher when people call. very cute… i have a cozy for my phone but it doesn’t have a CC slot or a ring to attach to my keys… maybe its time to make a new one! aaah! I need to make this exact thing! I have been thinking about this for a while, but like many other projects… it’s on a list for now. I also LOVE my iphone and some apps I love are Camera Bag – you can make polaroids with this too, but also Holga-like, 60s/70s looking photos, and others. Favourite game is Frenzic, I’m addicted to it like I was to tetris 20 years ago. Also Tweetie to keep up with twitter and flixter for movie times/locations, etc. I have an app called “Spending” that is a little gem. You write down everything you spend money on and it tallies it and creates pie charts. I mean, I could write it down, but seeing it on the screen is particularly shocking and effective! What talent, this is a lovely thing you’ve made. Cute! 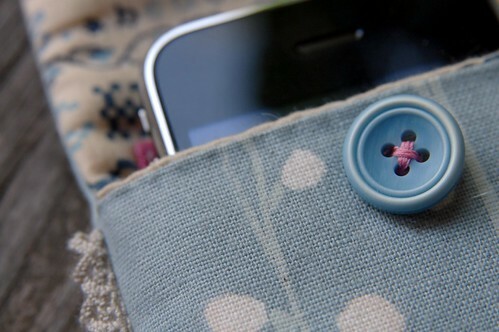 I’ve been meaning to make a cozy for my iPhone as well… I’ve had my phone for over a year. :/ Thanks for the app suggestions, too! this is a really good post, karyn! have you named your iphone? i’ve been looking for a good app for my list of things to do and just recently deleted one that i wasn’t satisfied with. i will for sure be downloading this one! I’ve been wanting to buy an iPhone for quite a while now, and your adorable cozy is making me want one even more! It is very, very cute. 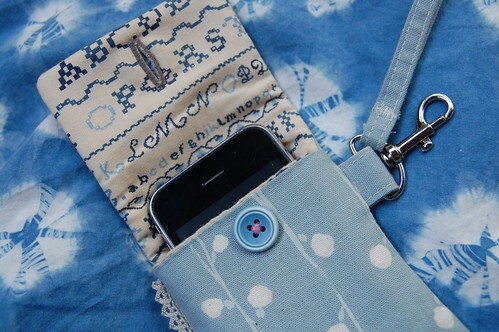 Maybe I should start making one now, so when I finally get the phone it will have a home right away! Thanks for the motivation. That’s so cute. I love the little bit of lace along the side. My ipod needs a new cozy and something like this would be perfect (I’ll just need to add a pocket on the back for the earbuds). It’s so lovely, when I have an iPhone, I’ll try to do a cosy as nice as yours! Lovely! And very well thought out. Oh my — I was checking out your site to get away from my current obsession of researching whether to get an iphone or an itouch — in fact I was going to remind myself what kind of camera you use, and WHAMMO. An iphone AND a cozy. You clinched it!!! And a cozy iphone it must be! thank you so much for the link to polarizer – i think that app is such fun! your iphone case/holder is just beautiful!!! I love your ipod cozy! what a great idea to clip it to maisy’s collar — I’m going to borrow this idea! That gelaskin is fabulous too! Hi! 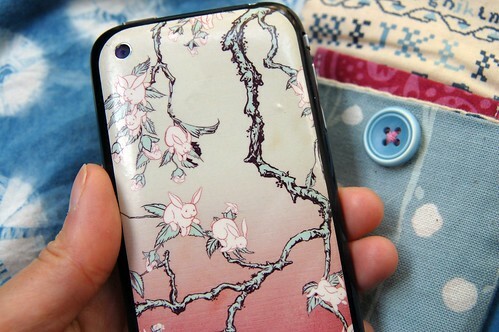 I fell in love with your iphone cozy (as well as the cover, how fabulous. i will be purchasing one of those! )… As a new sewer I am not quite intuitive about making things, did you use a pattern? Any ideas on how I could sketch this out to sew? So happy to be following your blog!